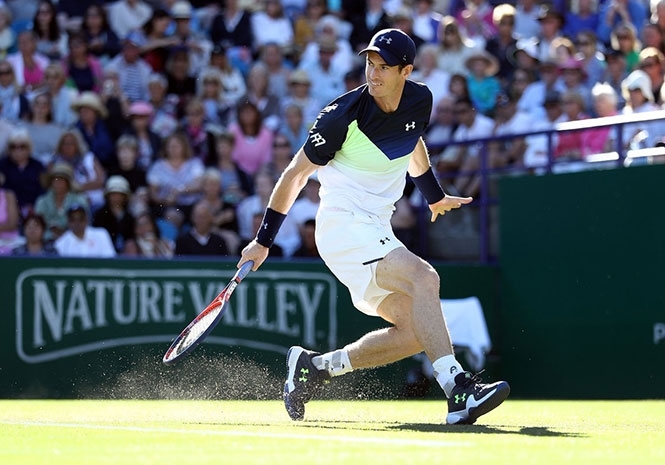 FITNESS TEST: Murray faces a race to be ready for Wimbledon this year. TWO-TIME Wimbledon champion Andy Murray has today been drawn against eccentric Frenchman Benoit Paire in the first round of the tournament, which starts on Monday. Murray said after his loss to compatriot Kyle Edmund at Eastbourne on Wednesday that he would only play at the All England Club if he knew he could compete. Ironically, Paire was the last man Murray beat at Wimbledon last year, a straight sets win in the fourth round. The 32 year-old Scotsman continues to evaluate his physical fitness on a daily basis, and is practicing again today in preparation for the match on Tuesday. Paine has a big serve and a world-class backhand, but his forehand is so unpredictable that he sometimes runs around to hit the double-hander instead – unheard of in tennis. He also has a fondness for eye-catching looks, including hair that has been dyed white and light grey. It is not the easiest draw for Murray, as Paine has been as high as 18 in the world, and had two match points against Federer last week which he failed to convert. Meanwhile British number 1 Kyle Edmund has a slightly more comfortable opening match against Australian qualifier Alex Bolt, the world number 205.